Sara Recharge is one of the growing and the best online recharge service provider in India. It offers a wide range of services like mobile recharges, Datacard recharges, DTH recharges and payment of bills. There is no restriction of day and time. You can recharge anytime and anywhere you want. 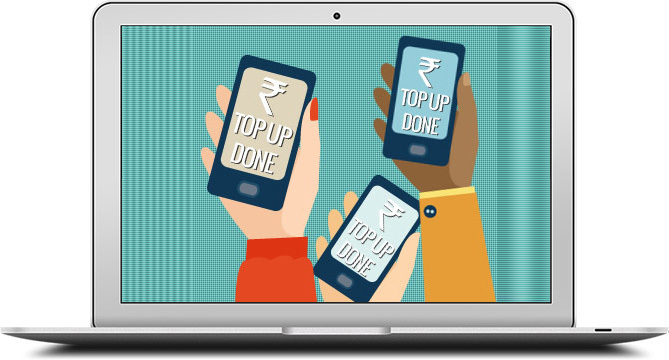 Even, you don’t need to ask for the latest recharge offers to the customer care, you can view all recharge plans on the website itself. At Sara Recharge, we also offer instant recharge as Sara Recharge securely saves your card details and you don’t need to enter the details again and again to recharge your phone every time. We also provide opportunities to become a retailer and distributor to start your own recharge business. As mobiles have become like a basic need, so everyone likes to stay connected with their family members and friends always. Sometimes, when you are in an emergency situation, but your balance goes low. In that situation, you can recharge your phone anytime and anywhere. What you need is just a good internet connection. We at Sara Recharge provide you instant mobile recharge to cater your needs. At Sara Recharge, you can recharge mobile phones of various operators like Airtel, BSNL, Aircel, Vodafone, Tata Docmo, Tata Indicom, Idea, and many more. We don’t charge any additional charges to recharge your phone. You can also grab various exciting deals and discounts by recharging your mobile at Sara Recharge. Datacards are used to access internet from your personal computer or laptop. Sara Recharge, also offers you the facility of recharging your datacards like MTS Mblaze, Aircel pocket recharge, Tata Photon, Reliance Netconnect and many more. Now, you can enjoy watching your favorite TV channels without any interruption as you can recharge your DTH services anytime and anywhere at Sara Recharge. We offer DTH recharge services of various DTH operators like Dish Tv, Airtel Digtial TV, Tata Sky, Sun Direct, etc. At Sara Recharge, you can not only recharge your phone, but you can also pay electricity bills and gas bills of major electricity and gas providers like Tata power, Reliance Energy,etc. and Indraprastha Gas, Mahanager Gas, etc. At Sara Recharge, you can also pay your insurance installments easily. Various Insurance providers available at Sara Recharge are: LIC Premium, Tata AIA Life Insurance, and ICICI Prudential Life Insurance.